A few weeks ago, Yvonne of Quilting Jetgirl posted a video tutorial for a quilting design she calls Circuit Board quilting. I loved it immediately and thought it would be perfect for the quilt I'm working on now. So one day last week, while the kids I babysit coloured, I spent a little time drawing the design. I had no trouble drawing it, so I moved right on to quilting it once I got my quilt basted. After I'd been quilting for about an hour, I wanted to check Yvonne's tutorial for something and when I looked at her quilting I realized mine looks nothing like her circuit board design! Mine is really nothing more than a square meander and lacks all of the long, echoed lines I love about Yvonne's design. How did that happen, you ask? Well, it's pretty simple, really. I watched Yvonne's tutorial once a few weeks ago. Then, when I had time to try drawing the design, I thought I remembered what she did, so I just went with that rather than checking to make sure I had it right. But I didn't have it right at all! Thankfully, I quite like the texture the square meander quilting is creating, so I'll stick with it, though I will add some of the long, echoed lines from the circuit board design. I will definitely keep Yvonne's design in mind for another quilt, and I'll check her tutorial before I start next time! On Friday morning I made a kind of bread I've made many times before. I had the dough rising before the kids I babysit arrived so that all I had to do while they played was shape it, let it rise again and then bake it. When the timer went for me to take it out of the oven, I opened the oven door to find a very dark loaf of bread, not at all the beautiful golden colour I'm used to. Turns out, I turned the oven on 50° too hot because I didn't bother to check the recipe. I thought I remembered from all the other times I've made it...except I was remembering the temperature for another bread I make often. Thankfully the inside of the bread was still fine to eat, but we didn't eat the crust this time around! Both times, I thought I had something all figured out when in fact I didn't. I could easily have gotten the facts right if I had taken the time to check, but I thought I knew what I was doing and didn't need to check. How wrong I was! There are times we think we have life all figured out, only to find out later we couldn't have been more wrong. Times when we get upset because we think someone is saying or doing this because they're feeling that, only to find out later that wasn't the case at all. Have you ever had that happen? Have you ever made assumptions about someone else's motives and made judgments based on those assumptions, only to realize you were completely wrong? James wrote, "If any of you lacks wisdom, you should ask God, who gives generously to all without finding fault, and it will be given to you" (James 1:5). We need wisdom for life. We need wisdom to know what we should be doing. We need wisdom to understand what other people are doing and why. We need wisdom to see how we can serve others. We need wisdom to know when we need to accept help from others. We might think we have it all figured out, but there's no doubt in my mind that I sometimes fall into the category of those who lack wisdom. But look at what James tells us: if we ask God for wisdom, He gives it generously. Not just a little, not just barely enough to get us through, but generously. Abundantly. And He gives us His wisdom without finding fault with us. 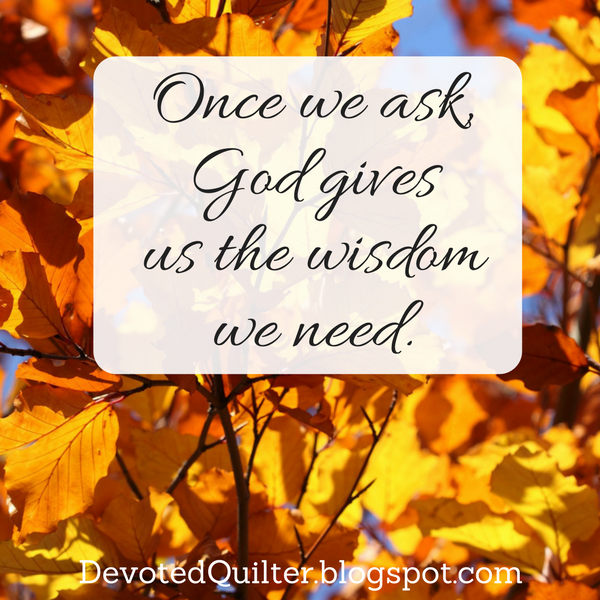 He doesn't scold us for not already having all the wisdom we need. He doesn't tell us we should know better. He just gives it to us generously. But first we have to ask. We have to acknowledge that we don't, in fact, have life all figured out. Then, once we ask, He gives us the wisdom we need. Thank you. This post has come at the right time for me, Leanne. God bless you! Preach!! So true, so very true. I sure need a double dose!